One of the most powerful features of Chrome OS is the integration of third-party Chrome extensions. By definition, Chrome extensions extend the power of Chrome and perform functions not built directly into the browser. When extensions are paired with excellent teaching practices, they have great power in the classroom to make student thinking visible. Chrome users can find extensions in the Chrome Web Store, however, the amount of Chrome Extensions in the marketplace can be overwhelming. To make that process easier for you, I describe my three favorite Chrome extensions for you to try by the end of this school year. 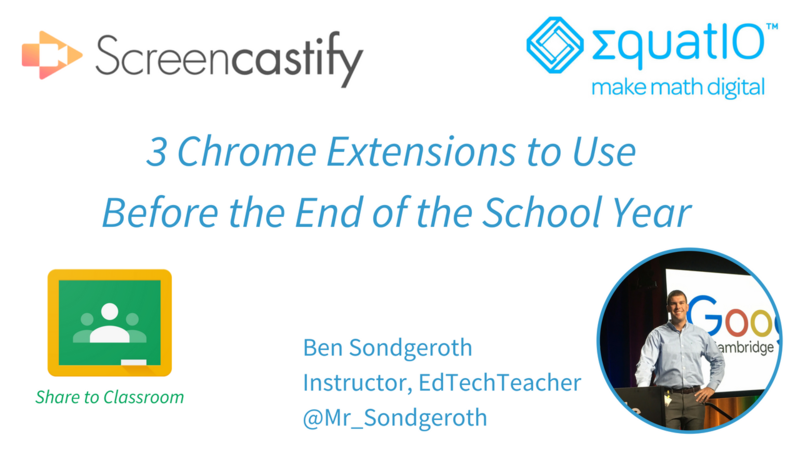 Screencastify is a Chrome extension that allows students and teachers to create screencasts directly in the Chrome browser. A screencast is a recording of the user’s screen with the user narrating the actions they are completing on the screen. Screencasting is a powerful way for students to demonstrate their learning and understanding through audio and video and Screencastify allows students and teachers to do this quickly and efficiently. The free version of Screencastify allows users to create any number of screencasts up to a maximum of ten minutes each. When setting up the extension for the first time, users can choose to have Screencastify link directly to their Google Drive. This is important, as once you complete the video it is automatically saved to Google Drive and organized into a Screencastify folder. Describe and explain an image created in Google Drawings or Slides. Use Screencastify on top of Google Slides to tell a story or give a quick presentation. Use Screencastify with Version History in a Google Doc to reflect on the process of writing..
Use Screencastify to explain a Padlet, ThingLink, etc. Use Screencastify to record reading fluency or to explain a passage from a website, PDF, or Google Play Book. There are many ways that screencasting can be beneficial in the classroom and using Screencastify allows students to demonstrate their learning and make their thinking visible. EquatIO is a new tool from Texthelp that provides teachers and students new and better ways to integrate math and science into their Google environments. EquatIO gives students and teachers an ability to make mathtype digital, so students are able to better make their math reasoning visible using Google Chrome. EquatIO is available in free and premium versions. With the free version, students can enter math equations only in Google Docs and Google Forms. Teachers have the ability to use the premium version of EquatIO for free across all core Google Apps including: Google Docs, Google Forms (Creating and Responding), Google Slides, and Google Sheets. In order for students to use the extension in these apps, schools will need to purchase the premium version. For a quick tutorial on how to use Equatio in Google Docs, watch the screencast below. Integrating math type in a Chromebook classroom can be a daunting task for teachers. EquatIO gives those teachers and students a great way to make their math thinking visible in their classrooms. Share to Classroom is an extremely helpful tool for teachers using Google Classroom with their students. The extension connects with the teacher and students’ classes in Google Classroom. From a teacher perspective, the Share to Classroom extension allows teachers to share information from websites directly to their classes in Google Classroom. For example, when a teacher comes across a webpage that they want to add as an assignment, question, or announcement, teachers can use the extension to share these resources directly to a class. Teachers can also share web pages and content directly to students in real time. When encountering a web page and selecting the extension, teachers can use the Push to Students option to send and open that page on all student devices. Tech tip: student devices also need to have the extension running. Teachers using this can quickly disseminate information to students in an efficient manner. In a similar fashion, students can share information to the teacher using the extension. When a student discovers content on a webpage that he would like to share with the teacher, the student can select the extension and then select Push to Teacher. As students do this, the teacher receives a notification, allowing her to open the shared content in a new tab. By sending this notification, teachers are able to filter the content shared to them, and prevent students from sharing content to the teacher’s computer at will. When I was teaching, my students would often discover interesting information that I would want to share with the rest of the class, but it would often be a multistep process to share with the students. With the push to teacher option, students can share their discovery with the teacher’s computer, and the teacher can then display it on the projector or push it out to all the students. Ultimately, this process engages students encouraging them to share their work or their thinking with the rest of the class in a simple process. Screencastify, EquatIO, and Share to Classroom help encourage students to make their thinking visible, so educators can increase engagement and get a better glimpse into student learning. These three extensions provide a wide variety of ways that teachers can help students to demonstrate their understanding of concepts.